As a glittering cloud of red, white and blue confetti exploded over thousands of spectators and “The Star-Spangled Banner” boomed throughout Lyon’s cavernous Euroexpo arena, I grabbed my camera and jumped the wall of the press box, to get closer to the action as the crowds descended upon Mathew Peters and Harrison Turone, who had just made culinary history by winning America’s first gold medal at the Bocuse d’Or. Peters, Turone and their coach, Philip Tessier, made it to the stand, their dumbfounded teary expressions captured on the massive jumbotron looming above. 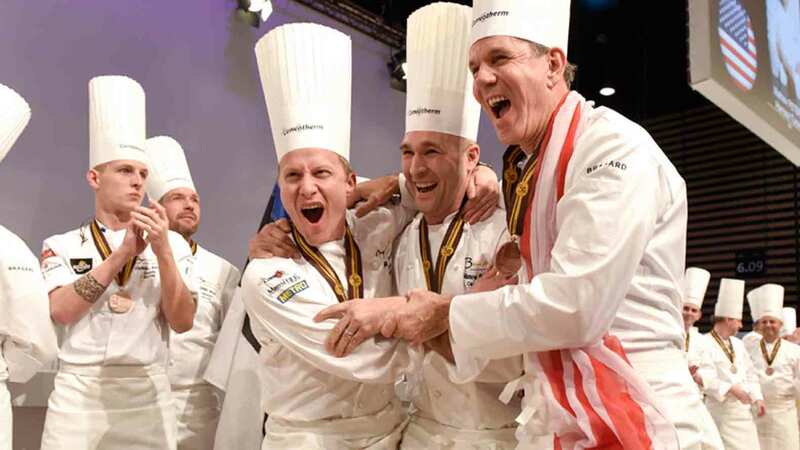 They clutched the gold statue of Bocuse and posed for photos with a parade of legendary chefs including Alain Ducasse, Georges Blanc, Thomas Keller and Daniel Boulud. It’s no wonder Peters and Turone were in a daze, having just presented their show-stopping dishes after two intense years of planning and practice. They had achieved their dream and won over an arena full of screaming fans from all over the world, even if only a few people back home in America would understand the magnitude of their win. 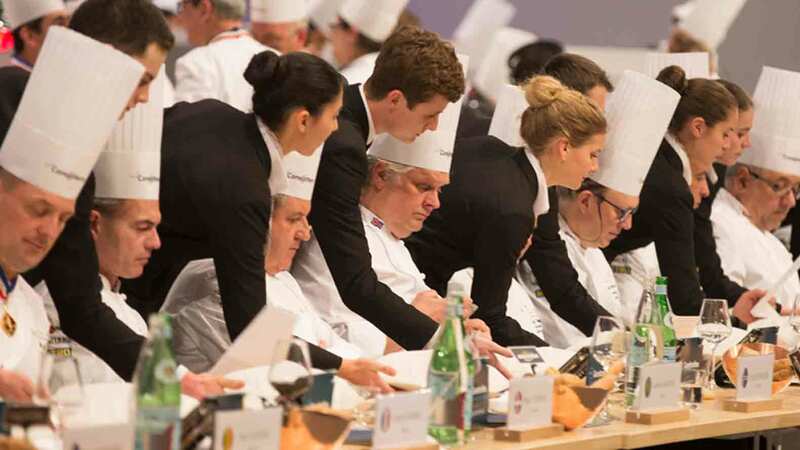 But for those in the know, the Bocuse d’Or cooking competition is like Top Chef on steroids, albeit without the fan favorites, tasting notes or snarky back-stories, and journalists came from all over the world to cover the 30th anniversary of this biennial competition. We were confined to a small space opposite 12 six-by-three meter kitchens while we watched 24 teams from around the world compete. For two days, we contorted ourselves around camera lenses and clunky tripods, terrified to leave our spots for water, lunch or bathroom breaks lest we miss a minute of the action. 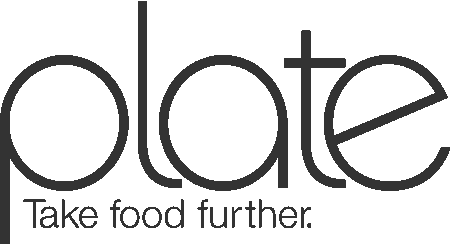 Fueled by almonds and clinging to every last bar of power on our phones, we endured hours of screaming crowds, blaring bullhorns and European techno music while we kept our eyes glued to every over-the-top platter that paraded by us on its way to the judges’ table. But it was worth it to take in Team Japan’s blue-lobster stuffed chicken, split in half by a shimmering samurai sword over a wooden box decorated with origami birds and delicate vegetable garnishes. Or Team Denmark’s lavish interpretation of Paul Bocuse’s famous Bresse chicken cooked inside a pig’s bladder, which when inflated and placed high on a silver pedestal in the center of the tray looked like a science fiction egg laid from another dimension. Or the platter from Team France, known for its jaw-dropping presentations, with chicken and crayfish carefully placed amid a winter mountain scene complete with a rose rising out of the middle. As each platter passed us, the crowds in the soaring grandstands erupted into a cacophony of noise, a raucous sea of waving flags, painted faces and colorful signs. The Norwegians took the idea of “more cowbell” to a whole new (ear-splitting) level, while the French brass band played “La Marseillaise” at top volume over and over again. The Aussies came armed with didgeridoos that droned on in my ears long after we left, while the Japanese repeatedly beat two massive drums. Bullhorns blared from the American section, as did clapping, hollering, chanting and whistling—the volume only increasing as the chefs approached the finish line, and becoming exponentially louder as the winners were announced. So why does this competition warrant frenzy in Europe while flying below the radar in America? 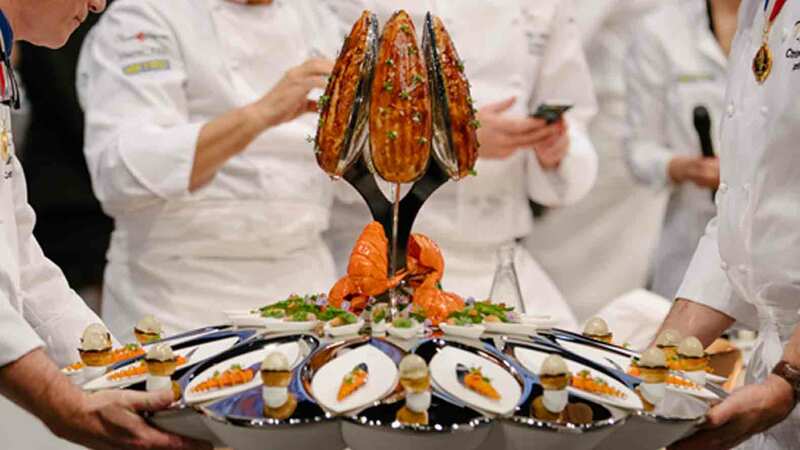 The Bocuse d’Or is old-school cooking: dishes from Escoffier plated in ornate presentations that would be out of place in most trendy American restaurants. 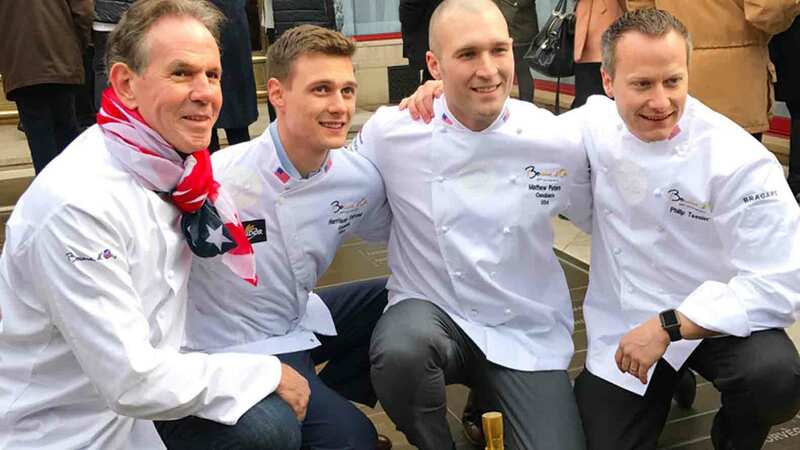 But it’s starting to gain attention among American chefs, especially since 2008, when Thomas Keller, Daniel Boulud and Paul Bocuse’s son Jérôme joined forces to create a foundation that would help build, train and finance a stronger Team USA. The heavyweight chefs’ involvement caused a definite shift in the tide of the competition previously known for attracting mostly hotel and catering chefs. “[The foundation] really gave us some legitimacy,” says Gavin Kaysen, vice president of the team, who represented the USA in 2007 and coached the team in 2009, 2011, 2013 and 2015. 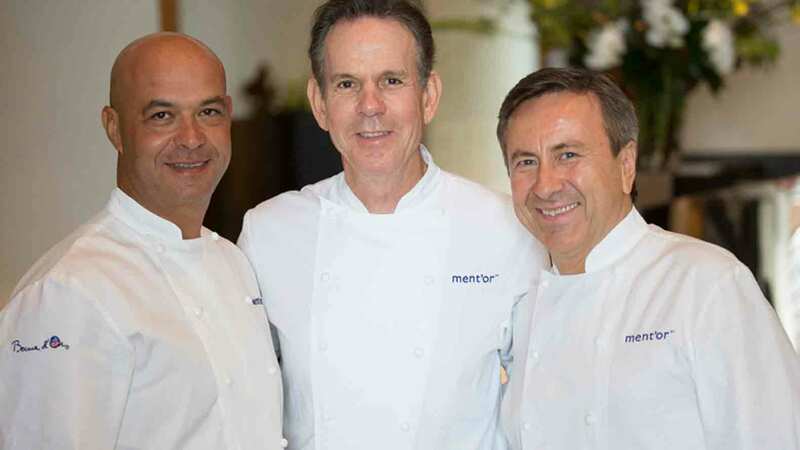 “And for a while now, it’s been restaurant chefs coming out of the woodwork to do it—guys from the Daniel Humm, Daniel Boulud or Thomas Keller crowd seeing it as an opportunity to help excel themselves and their career. Chris Pandel of Chicago’s The Bristol has similar respect for Bocuse. 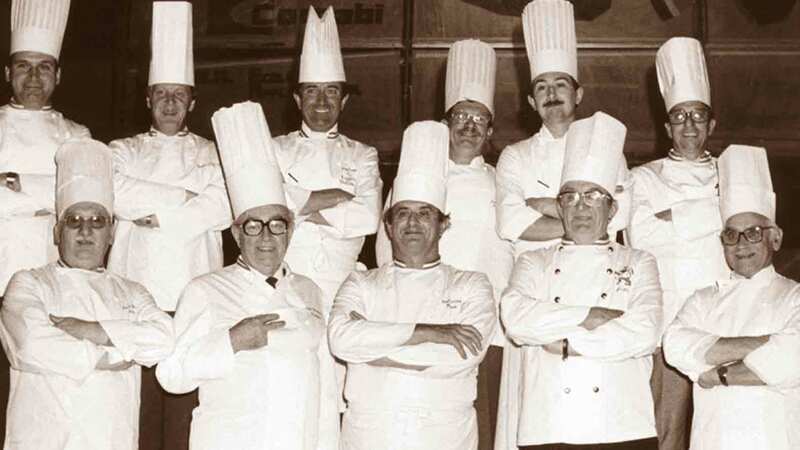 He recalls two types of students in culinary school, the “garde-manger nerds” who wanted to push boundaries with over-the-top showpieces, and the ones who just wanted to cook. He admits he is the latter, but is inspired by the former. 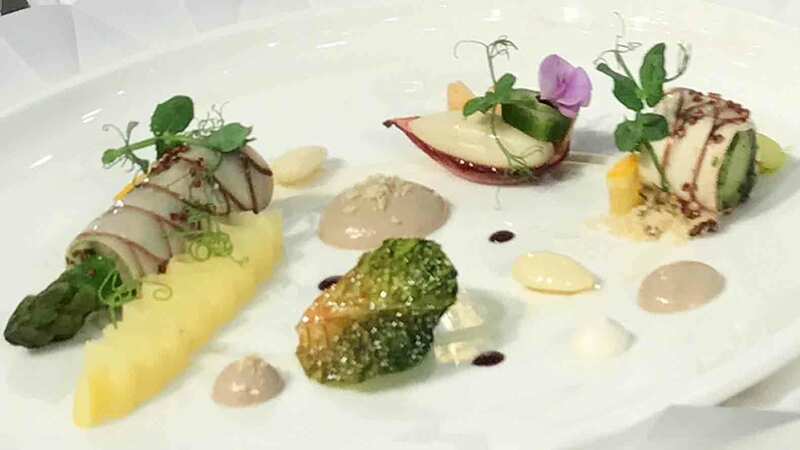 Bocuse is one of the most impressive things in the culinary world. It’s mind-blowing. 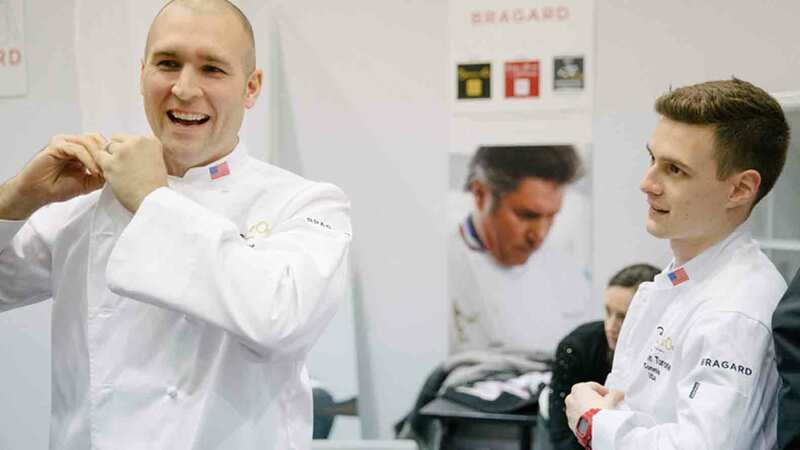 Tessier agrees that in order to get people engaged in the Bocuse d’Or, it needs to be accessible and entertaining. “It’s difficult to ask Americans to follow a cooking competition in France that happens every two years with little to no hope of U.S. placing or winning, and that is also difficult to follow,” he notes. And while chefs including Baxtrom and Pandel followed the competition all the way to the final moment, it’s still a struggle to get most Americans to care. But that’s changing. Congratulations to Team USA. I was in Las Vegas for the tryouts. I have been a part of a Culinary Olympic team. Only those who have tried can understand what these men have done. It is a shame that we can't get more attention in the U.S for real chef competitions and the people who compete in them! I'm about 2/3 of the way through this LONG article, and am drinking in the whole of it. I'm not working in food service any longer (CIA, 1978), but it's incredibly inspiring to read each step of this process, making me wish I was right there with an apron on at best, or looking in the window at worst. Wow, what an incredible process this is for the competition, and something which those who've never worked in a GOOD kitchen will NEVER understand. Keep it up, and Vive la Toque!! Thank you for reading and so glad you like the piece! It is such a monumental competition!